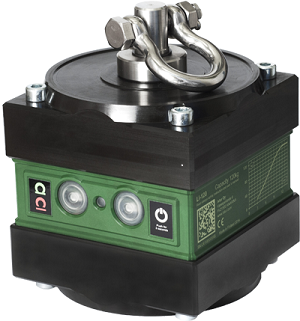 For Immediate Release: Posted On 4/27/2015 By Industrial Magnetics, Inc.
Industrial Magnetics, Inc.(IMI) recently announced their agreement with Ixtur® of Finland, which awards them the USA distributorship for the Ixtur LI-120 automatic lifting magnet. The agreement gives IMI the sole right to market and sell the Ixtur lifting device in the United States. The lift magnet is unique in that no user interface is required to turn the magnet on or off, due to the proprietary, built in, load-sensing system. This feature employs a self-adjusting shaft and rechargeable battery, which allows the magnet to automatically switch between the on/off state every time it raises or lowers a load to and from the resting position. Manual control is also possible for the operator by pressing the push buttons located on the side of the magnet’s housing. The LI-120 utilizes a rechargeable battery to provide the electronic impulse that switches the magnet from on to off and vice-versa, but no electrical power is used during the lifting process. This low energy consumption feature provides over 1,000 lifts with a complete two hour battery charge. "We are really excited about showing this magnet to our lifting customers", states IMI President, Dennis O’Leary. "It’s fast cycle times, automatic switching and small footprint make this a great fit for operators who are doing quick, repetitive, loading or unloading". Visit the LI-120ALM Ixtur Lift Magnet page for more information or contact Industrial Magnetics, Inc. at 888.582.0822.